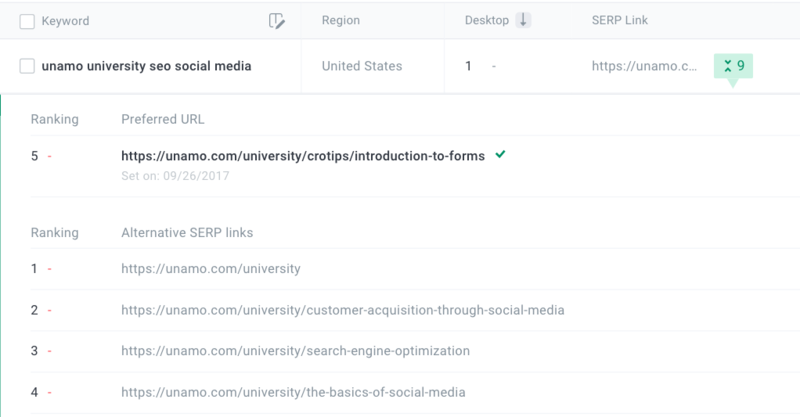 In your Unamo SEO campaigns you can not only view every URL that ranks for a specific keyword, but you'll be able to choose which URL you would like to be the primary URL you see rankings for in your default keywords view. This will also ensure that you begin collecting historical data for the preferred URL once you set it as preferred. This feature is enabled for desktop, mobile and desktop vs. mobile views. Click the numbered dropdown next to "Landing Pages" to view the alternative links that are ranking for the keyword. The number represents how many SERP Links in total you have ranking for that keyword. Click on the URL that you would like to set as the preferred one. You will not collect historical data for the alternative links while they are not set as the preferred URL. You will have and collect historical data for the preferred URL for as long as it is set as the preferred URL, but only after it is selected as such. Historical data will remain for older preferred URLs up until the point they were unselected as the preferred URL. Once you have confirmed the change, to see your updated rankings in the default keyword view for that URL, please refresh the page once it has been set as the preferred URL. When clicking on an individual keyword, you'll be taken to the single keyword view. Here you can also view your alternative links and see the historical data of the preferred URL. You'll also be able to view when the preferred URL was last changed. You can the daily rankings of your alternative links by either clicking on the SERP link of an individual keyword as seen above, or you can filter the SERP links. To filter by SERP links, you can select the SERP link filter in the filters dashboard. Default (All) - this will show you the default view of your keywords. Alternative Rankings: are higher than preferred URL rankings - this will show you all keywords in which the preferred URL's rankings are lower than one or more alternative link's rankings. Alternative Rankings: are lower than preferred URL rankings - this will show you all the keywords in which the preferred URL's rankings are higher than the alternative link's rankings.